Aristotle (384-322 BC) was a Greek philosopher born in Stagirus in 384 BC. His father, Nicomachus, died when Aristotle was a child, and he lived under a guardian's care. His father was a doctor at the court of AmyntasIII of Macedon, father of Philip II of Macedon and grandfather of Alexander the Great. In 367, Aristotle moved to Athens to study at Plato's Academy, where he stayed for 20 years. Aristotle left the Academy in 347 BC, the year Plato died.Some have speculated that he felt snubbed that Plato did not choose him as his successor. The more likely explanation, however, is that anti-Macedonian sentiment was on the rise in Athens, hence, Aristotle may have been afraid of persecution for his association with King Philip's court.Over the next four years, Aristotle traveled around the Eastern Aegean region, studying and teaching. During this time, he conducted a remarkable array of experiments and observations in biological sciences. In 343 BC, he was summoned back north to Macedonia to be personal tutor for King Philip's son, the young Alexander the Great. We do not know the precise relationship between Aristotle and Alexander, though their relationship has been the subject of much speculation and myth over the centuries.Historically, Aristotle lived in the twilight years of the Greek city-state. Ancient Greece consisted of a number of independent city-states, of which, Athens was the most significant. Though the city-states relied on slave labor and the disenfranchisement of women, the male citizens established one of the earliest forms of democracy. In the span of less than 200 years they managed to establish what the Western world still looks to as the basis ofits political institutions, philosophy, mathematics, drama, art, and architecture. Because slaves and non-citizen workers performed the bulk of the city's labor, male citizens enjoyed a great deal of leisure time. This leisure provided the opportunity for open inquiry into the nature of the world, and teachers like Aristotle were not uncommon.Aristotle was the first genuine scientist, and although he had his critics, every scientist is in his debt. Aristotle of Stagira is one of the two most important philosophers of the ancient world, and one of the four or five most important of any time or place. He was not Athenian,but he spent most of his life as a student and teacher of philosophy in Athens. As the Macedonians came to dominate Greece, Aristotle returned to Athens and set up his own philosophical school at the Lyceum, where he taught from 335 until 323. What we have of Aristotle's writings are mostly lectures he gave at the Lyceum in these years. "Aristotelian Corpus"is probably derived from the lectures that he gave in the Lyceum.Their dry style and uneven structure is partly due to the fact that they were lecture notes never intended for publication and partly a result of the fact that they were patched together into their present form by editors many centuries after Aristotle's death. 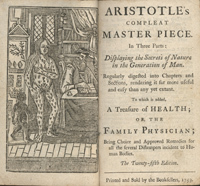 Aristotle published many popular works admired for their lively style, but none of these have survived. Aristotle's published writings were all lost or destroyed in the centuries after his death, and what we have are lectures, or notes on lectures, that Aristotle gave at the Lyceum. These works were first collected two centuries after Aristotle's death by Andronicus of Rhodes. As a result, we do not know the chronology of Aristotle's writings, and are unsure if Andronicus arranged them in the order that Aristotle had intended, or if all the works collected by Andronicus were written by Aristotle. We can also be quite confident that what Andronicus collected constitutes less than one-third of all Aristotle's writings. However, even this small collectionis impressive. Aristotle's influence on subsequent generations is quite significant. Only Plato can compare in importance. 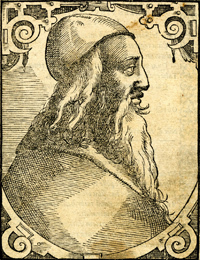 Though Aristotle's works were lost to the West for many centuries, they were preserved by Arab scholars and transmitted back to Europe in the Middle Ages. Thanks mostly to the work of Saint Thomas Aquinas, Aristotle's writings carried an authority in the late Middle Ages that was second only to the Bible. His work in logic and biology was not significantly improved upon until the nineteenth century. Though modern science and philosophy found their identity by rejecting or disproving many of Aristotle's results, his methods continue to have a deep influence on philosophical and scientific thought. Aristotle is the founder not only of philosophy as a discipline with distinct areas and branches, but, still more generally, of the conception of intellectual inquiry as falling into distinct disciplines. He insists, for instance, that the standards of proof and evidence for deductive logic and mathematics should not be applied to the study of nature, and that neither of these disciplines should be taken as a proper model for moral and political inquiry. He distinguishes philosophical reflection on a discipline from the practice of the discipline itself. His writings cover many subjects, including physics, metaphysics, poetry, theater, music, logic, rhetoric, linguistics, politics, government, ethics, biology, and zoology. Aristotle's writings were the first to create a comprehensive system of Western philosophy, encompassing ethics, aesthetics, logic, science, politics, and metaphysics. Aristotle's writings show he was well versed in Platonic philosophy. The centerpiece of Plato's philosophy is his Theory of Forms,according to which objects of experience are just shadows of a higher world of "forms"that lie beyond sensory experience. The various things we see in this world that we call beautiful have beauty because they participate in the "Form of Beauty", which is itself immaterial and eternal. In Plato's view, the purpose of philosophy is to train the intellect to see beyond appearances and to grasp the higher world of "forms". Counterbalancing the idealism of Plato's philosophy is Aristotle's background as the son of a doctor. Aristotle was probably brought up to pursue a medical career, and his writings on biology show a very sharp understanding of anatomy. Throughout his writings, Aristotle refers to biology as a paradigm for making sense of the world, much as Plato refers to mathematics. This emphasis on biology leads Aristotle to favor close observation of natural phenomena and careful classification as the keys to making sense of things. As a result, his philosophy is much more empirically oriented than Plato's, and Aristotle rejects the idea that we can only make sense of this world by appealing to invisible entities beyond it. Logic - Aristotle's "Prior Analytics" constitutes the first attempt to formulate a system of deductive formal logic,based on the theory of the "syllogism". The "Posterior Analytics" uses this system to formulate an account of rigorous scientific knowledge. "Logic", as Aristotle conceives it, also includes the study of language, meaning, and their relation to non-linguistic reality; hence, it includes many topics that might now be assigned to philosophy of language or philosophical logic. The study of nature - About a quarter of the corpus consists of works concerned with biology. Some of thesecontain collections of detailed observations. Meteorology contains a similar collection on inanimate nature. Others try to explain these observations in light of the explanatory scheme that Aristotle defends in his more theoretical reflections on the study of nature. These reflections, especially in Physics and in Generation and Corruption, develop an account of nature, form, matter, cause, and change that expresses Aristotle's views about the understanding and explanation of natural organisms and their behavior. Natural philosophy and cosmology are combined in On the Heavens. Metaphysics - In his reflections on the foundations and presuppositions of other disciplines, Aristotle describes a "universal science of being", the concern of Metaphysics. Part of this universal science examines the foundations of inquiry into nature. Aristotle formulates his doctrine of substance, which he explains through the connected contrasts between form and matter, and potentiality and actuality. One of his aims is to describe the distinctive and irreducible character of living organisms. Another aim of the "universal science" is to use his examination of substance to give an account of divine substance, the ultimate principle of the cosmic order. Philosophy of mind - The doctrine of form and matter is used to explain the relation of soul and body, and the different types of soul found in different types of living creatures. In Aristotle's view, the soul is the form of a living body. He examines the different aspects of this form in plants, non-rational animals and human beings, by describing nutrition, perception, thought, and desire. His discussion in On the Soul, and also in Parva Naturalia covers topics includingphilosophy of the mind, psychology,physiology, epistemology, and theory of action. Ethics and politics - Nicomachean Ethics, Eudemian Ethics, Magna Moralia – In Aristotle's view, the understanding of the natural and essential aims of human agents is the right basis for a grasp of principles guiding moral and political practice. These principles are expressed in his account of human wellbeing, and of the different virtues that constitute a good person and promote wellbeing. The description of a society that embodies these virtues in individual and social life is a task for "Politics", which also examines the virtues and vices of actual states and societies, measuring them against the principles derived from ethical theory. 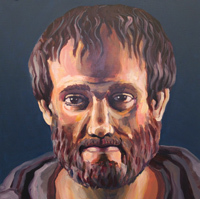 Literary criticism and rhetorical theory - Poetics, Rhetoric -- These works are closely connected both to Aristotle's logic and to his ethical and political theory. More than 2300 years after his death, Aristotle remains one of the most influential people who ever lived. He contributed to almost every field of human knowledge then in existence, and he founded many new fields. According to the philosopher Bryan Magee, "it is doubtful whether any human being has ever known as much as he did". Among countless other achievements, Aristotle was the founder of formal logic, pioneered the study of zoology, and left every future scientist and philosopher in his debt via his contributions to the scientific method. Despite these achievements, the cost of Aristotle's errors is considered by some to have held back science considerably. Bertrand Russell notes that "almost every serious intellectual advance started with an attack on some Aristotelian doctrine". Russell also refers to Aristotle's ethics as "repulsive", and calls his logic "definitely as antiquated as Ptolemaic astronomy". Russell notes that these errors make it difficult to do historical justice to Aristotle, until one remembers how much of an advance he made upon all of his predecessors.